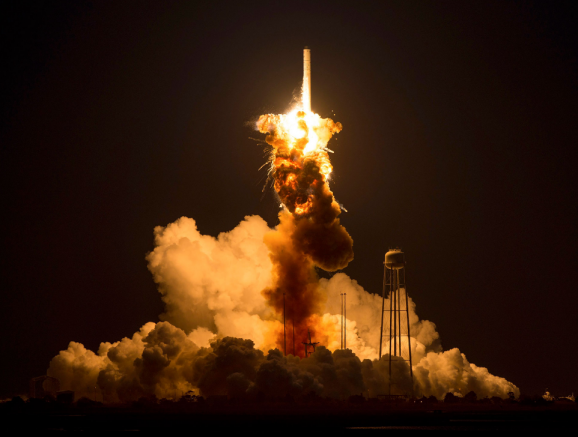 One of Orbital Science’s Antares rockets exploded yesterday, just seconds after launch from Wallops Flight Facility in Virginia. Orbital Sciences is one of the private companies contracted to bring supplies to the ISS — it was the second private company to complete a cargo run to the ISS (SpaceX was the first). Yesterday’s flight would have been the third such mission for Orbital Sciences, but instead, it’s entering the record books for another, grimmer reason. While the explosion shook those near the launch site and was by some likened to a small earthquake, no one was injured. It isn’t clear yet what happened, and today an investigation team began sifting through data, while another started sorting through debris near the crash site. Frank Culbertson, Orbital Sciences’ executive vice president, says the company will “get things back on track,” and that such an occurrence is, unfortunately, all too common, but they’ve “all seen the teams recover from this, and we will do the same.” Of course, that can’t happen until damage to the launch pad and other infrastructure is repaired, so it might be a while. One of the focal points of the investigation will be the AJ-26 engines used during lift-off. Those engines were built for a Soviet Moon rocket, comparable to NASA’s Saturn V. The projects that used the rockets were derailed, largely because of launch failures and explosions. The one used in Wednesday’s launch had been “refurbished to modern standards,” but earlier this year one blew up during ground testing. Despite NASA’s contracting of resupply runs, the incident serves as a reminder than nothing is easy or routine when it comes to space. 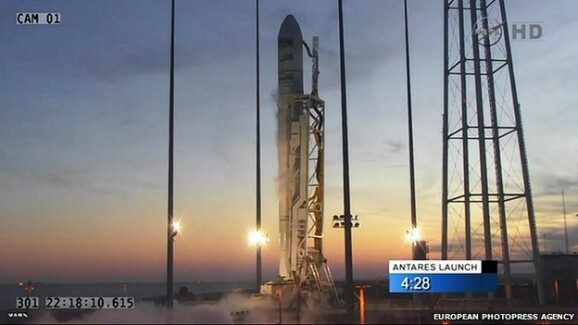 Antares was carrying an estimated $200 million cargo, including the Cygnus spacecraft that was to be launched by the rocket (and would have docked with the ISS). There were 5,000 pounds of supplies on the craft, including food and hardware. There were also experiments — many of which had been designed and developed over a period of many years — involving blood flow to the brain, immune system responses in space, meteor analysis, and the growth of pea shoots in space. Culbertson warned the public against hunting for debris, saying that there was a lot of “hazardous” material on board — nothing anyone should keep as a souvenir. Luckily, none of the six astronauts currently on the ISS were in urgent need of any of the supplies. Russia launched its own cargo ship today, which arrived safely at the ISS with three tons of food. I guess it’s a good thing Russia hasn’t divested from the station yet. Oppsie, that will teach you to use russian knock off rockets!